Harrogate Town are to play a Blue Square North match at the home of League One Doncaster Rovers. Town have rearranged a home fixture against Workington, due to be played at Wetherby Road on February 5, to the Keepmoat Stadium on Tuesday, January 22 (kick-off 7.45pm). Town have struggled with postponements this season as the Wetherby Road pitch was relaid in the summer, and poor weather has not allowed the new surface to settle. Town currently have eight games in hand over league leaders Chester. 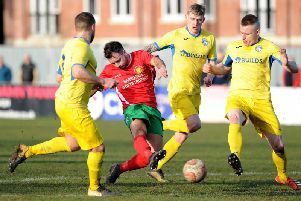 Assistant manager John McDermott told the Harrogate Advertiser the club was keen to find alternative venues for their home league matches, as waiting to play them at Wetherby Road could result in the team having to play up to three matches a week later in the season, in a bid to keep up. He said: “There is such a backlog of games now, if we did wait and tried to play them at Wetherby Road we could be playing three times a week near the end of the season. Fans will have to travel 50 miles from Wetherby Road to the 15,000 capacity Keepmoat Stadium. Read the manager’s thoughts and more on this story in this week’s Harrogate Advertiser.